The World Youth Alliance (“WYA”), a global coalition of young people promoting the dignity of the human person, states the following position on House Bill No. 96, the proposed “Reproductive Health and Population and Development Act of 2010” (“RH bill”). We wish to contribute the voices of 1 million young people from over 160 countries to this high profile debate on reproductive and maternal health, population, and integral development of the human person. So far as sound developmental policy and respect for human dignity are concerned, the RH bill suffers from flaws that undermine its efforts to improve Philippine society. The bill’s most serious flaw is its reliance on the false premise that a government-run population management program is necessary for the Philippines’s economic and social development. This unsupported assertion is contrary to sound developmental economics and undermines the very reproductive rights the bill strives to support. Tamping down population growth is the last thing the Philippines should be worrying about right now, for several reasons. First of all, the assumption that population management is necessary or even beneficial to sustainable economic development is simply wrong. For at least two decades now, economists have known that there is no correlation between population growth and economic development. [i] Some countries with large, growing populations are prosperous; others are not. Conversely, some countries with little to no population growth also do well; others do not. Population is not the issue. Secondly, even if the Philippines wanted want to tamp down its population growth, history shows that the sorts programs proposed by the RH bill are an ineffective way of getting there. Compare countries that instituted heavy-handed population control programs in the 20th century with countries that had no such programs: Fertility rates declined in both groups of countries, and at similar rates. [ii]The most important factor in determining a country’s fertility rate is its desired fertility rate, which explains 90% of actual fertility. [iii] Mere access to contraceptives, on the other hand, has only a 5% impact on total fertility. [iv]Desired fertility is, in turn, linked to the background economic and educational opportunities offered by society. [v] When women have access to education, when families know that children will be in school for the first quarter of their lives, and when parents believe that every child will have the opportunity to prosper, then people tend to make choices that result in smaller families. [vi] When these conditions are not present, families will be bigger, whether they have access to contraceptives or not. [vii] Economic development is a condition, not the result, of population stabilization. Fourthly, worries about tamping down population are a wasted effort in the face of the opportunities at hand. Right now, the Philippines is in position to enjoy the sort of “demographic dividend” that many of its Asian neighbors did in the late 20th century, when falling fertility rates lead to a large work force with fewer old and young dependents to support. [ix] That demographic transition is already occurring naturally in the Philippines. To take advantage of it, though, the country needs to ensure that its rising generations have access to the education, health, and opportunity necessary to prosper. Finally, the RH bill’s fixation on population management undermines the very human rights it seeks to advance. The government cannot, on the one hand, guarantee the “universal basic human right to reproductive health” with its concomitant “right to make free and informed decisions,” and on the other hand advocate a policy that tells parents—especially women—what their choices should be. Such an approach is an unjustifiable affront to the dignity and capacity of the poor. 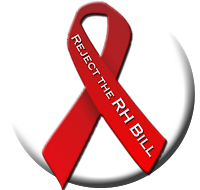 The current RH bill is permeated with a wrong theory of population and development. Fixing the flaw would require extensive revisions. Until those revisions take place, the bill should not proceed any further. 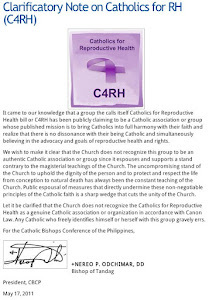 The second major flaw in the RH bill is that it imposes upon the freedom of conscience. The right to act according to one’s moral, ethical, and religious beliefs is recognized in both Philippine and international human rights law. [x] The RH bill, however, disregards that right in several key instances. The bill fails to protect the conscience rights of healthcare providers, by requiring them, upon penalty of imprisonment or fine, to assist patients in finding procedures that are contrary to the providers’ ethical convictions. This “referral requirement” should be eliminated. The bill would also require every employer, no matter the size, to provide the full range of reproductive health services to every employee, irrespective of the employer’s moral beliefs or the fiscal ability to do so. This provision is both an impediment to conscience and an anti-jobs measure because every worker in the Philippines is now more expensive to hire or retain. It should be eliminated. Parents and educators are given no assurances that they can opt out of portions of the RH bill’s new sexuality education curriculum if they find it contrary to how they believe they ought to raise their children or teach their students. The bill needs an opt-out provision. Finally, the bill’s criminalization of speech that “maliciously engages in disinformation” (an undefined category) about the substance or even potential motives behind the RH bill violates the constitutional right to free speech and expression. The provision should be eliminated in its entirety. The RH bill’s current provisions for maternal care are important, but underdeveloped in comparison with other parts of the bill. We recommend expanding the Population Commission’s (POPCOM) implementation mandate (Sec. 20) to include and emphasize maternal health, including: overseeing the bill’s obstetric care quotas (Secs. 5 and 6), improving the training of skilled birth attendants, and coordinating the deployment of skilled birth attendants. 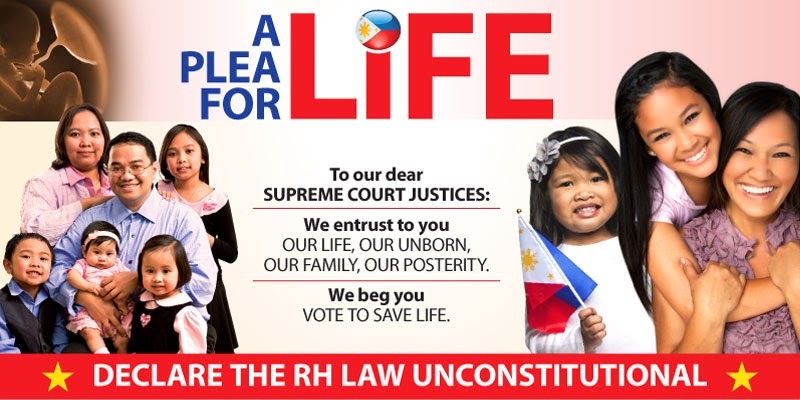 The current version of the RH bill is a self-conflicted document. Until the bill can be modified to address problems identified above—a faulty economic basis, violations of the freedom of conscience, and an under-emphasis on protecting unborn life and improving access to obstetric care—it should not advance any further in the Congress. The Philippines needs a better bill. If you have questions or comments please contact the WYAAP office at asiapacific@wya.net or our Director of Advocacy at becky@wya.net. Watch Renelyn Tan, Regional Director of WYA Asia Pacific, delivering a speech on WYA's stand regarding RH Bill in the Philippine Congress. [i] David E. Bloom, David Canning, JaypeeSevilla, “The Demographic Dividend: A New Perspective on the Economic Consequences of Population Change,” RAND Corportation, 2003, p. 17. [ii] Compare the decline in children per woman between 1950 and 2000 in high population control countries like India (5.91 to 3.11), Indonesia (5.49 to 2.38), Bangladesh (6.7 to 3.22) and Pakistan (6.6 to 3.99) with countries without extensive population campaigns: Brazil (6.15 to 2.35), Turkey (6.9 to 2.23), Argentina (3.15 to 2.35) and Algeria (7.28 to 2.53). Data from the United Nations Population Division. Cited in Matthew Connelly, Fatal Misconception: The Struggle to Control World Population, Cambridge: Belknap Press, 2008, p. 374. [iii]Lant H. Pritchett, “Desired Fertility and the Impact of Population Policies, “Population and Development Reivew 20 (1994), pp. 1-55. [vi] Jacqueline Kasun, The War Against Population: the Economics and Ideology of World Population Control, San Francisco: Ignatius Press, 1999, pp. 78-86. [viii]Joaquin Alumnina, Commissioner of the European Union, Closing Address to the Second European Demography Forum, November 25th, 2008 (“The economic impact of ageing will make it more difficult to finance our Social Model and to sustain it for future generations… impact of ageing in the EU will, from 2040 onwards, almost the halve the average growth rate of about 2 ½% in recent years”); European Demographic Report 2007, Executive Summary, page 6 (“Demographic change will gradually limit the scope for future employment growth”), 7 (“Projections show that, as employment decreases and productivity becomes the only source of future economic growth, the annual average potential GDP growth rate in the EU-25 will decline from 2.4 per cent in the period 2004-2010 to only 1.2 per cent in the period 2031-2050”); Wong, Theresa and Brenda S.A. Yeoh. “Fertility and the Family: An Overview of Pro-Natalist Policies in Singapore.” Asia MetaCentre Research Paper S eries, No. 12. AsiaResearch Institute, National University of S ingapore. Available at: http://www.populationasia.org/Publications/ ResearchPaper/ AMCRP12.pdf. Also see: Wijaya, Megawati. “Singapore faces a ‘silver tsunami.’” AsiaTimes Online. August 27, 2009. http://www.atimes.com/atimes/Southeast_Asia/KH27Ae01.html. Last visited: 8 September. 2010. Loh, Andrew, “MM Lee—population control revisited 30 years later.” The Online Citizen. Sept. 8, 2010. http://theonlinecitizen.com/2009/ 08/ mm-lee-%E2%80%93-population-control-revisited-30-years-later/. Last visited: 8 Sept. 2010. [ix] Roberto de Vera, “Economic Issues: the Consolidated Reproductive Health Bill in the House of Representatives,” The Bishops-Legislators Caucus of the Philippines, pp. 13-15.Based on data from the United Nations. [x]Philippines Constitution, Art.II, § 2; Universal Declaration of Human Rights, Art. 18. [xi]UNFPA Facts Sheet, “Delivering Hope and Saving Lives.” Available at: www.unfpa.org/webdav/site/global/shared/safemotherhood/factsheet3_eng.pdf. Last visited: 10 Sept. 2010. [xii]RH Bill Explanatory Note, p. 1 (“Correct and consistent use of contraceptives will prevent one-third of all maternal deaths”). Mga Iskolar ng Bayan against the RH Bill! Our people are our greatest asset!